Christians often do not realize a major point of the Bible in regard to the laws of tithing, though it is easy to recognize what this significant point is. Even in simple teachings of the Scripture, it is shown that it is not lawful for any Christian to tithe to a church, to a preacher or to a priest today. Not only that, if any preacher, evangelist or priest asks for and receives the ordained tithe of the Bible, those church authorities are guilty of breaking God's law. 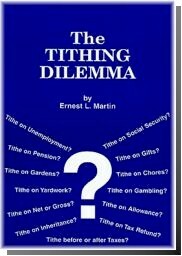 This book will reveal the interesting truth about the tithing laws of the Bible that the church leaders do not want the laity to know. Most people will be amazed at how misled they have been by the ecclesiastical authorities in regard to this matter of tithing. This is one book that all Christians who are interested in sound biblical doctrine should have for reference and for study. It makes the Bible make sense. Potential markets for this book will be those interested in financial matters relating to proper giving and charity and those seeking to understand the biblical plans and parameters for financing religious enterprises.